In this modern era, we all are surrounded by technology and gadgets, which is now becoming our common need. The need for these gadgets is increasing day by day because we all want all the things in our hand, just by one click and therefore, the demand for programmers and web (developers & designers) is growing very fast. But not only that, the demand for programmers and developers is also high, because of the good salary package. And that’s why our young generation is giving top priority to this field. The average salary of a Programmer or Developer in India is 4 Lakh p.a. (approx) for a beginner and in the developed foreign countries (like UK or USA), you will get even better. If you have the talent or If you are skilled in programming and web designing courses, so the companies are here for you, holding the door of your success and a bright future. Go and grab it! Do you want to be the part of technology world? 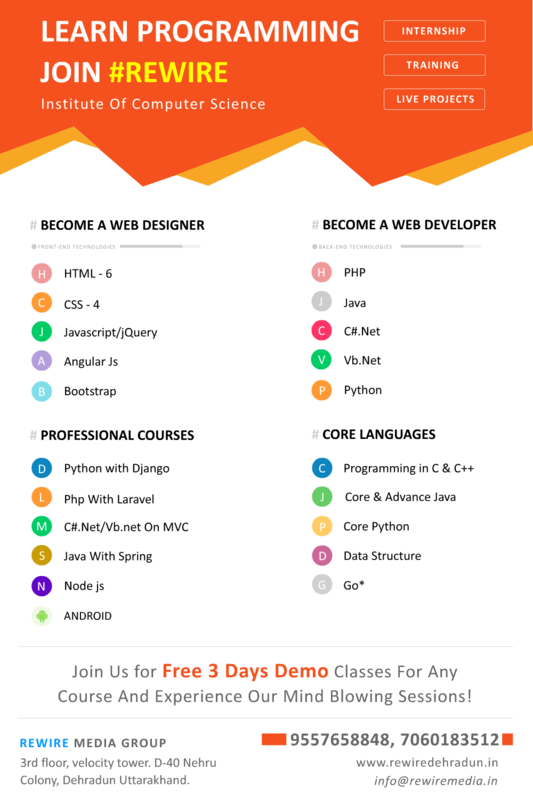 Do you want to learn programming and designing? If yes! then, join #Rewire! Rewire Institute of Computer Science is the best and perfect place for all seekers, who want to pursue their career in programming and web designing field. There are many institutes for programming and web designing training in Dehradun, but in that crowd, our institute is best, unique & experienced and how it is so, we will know further. But first of all, let’s know what is programming, web designing, and development. C is a machine language and widely used for many scientific programming. It is the basis of many programming languages or you can say the first ladder of programming for programmers. C programme starts with some syntax’s, then followed with logic and again, end with syntax. C is used for many purposes like it is used in making operating system development, making games, etc. C++ is another level of C language or in other words, high level of C. It is a general purpose object-oriented programming (OOP). It is mostly used for client-server applications, software, drivers, etc. Java is also a programming language and it is simply for write once, run anywhere i.e. “WORA”. Java is used for making enterprises software and android applications. Java is of two types, Core Java and Advanced Java. Core java is used for general application and on the other hand, Advance java is for web-based and enterprise applications. First, one must know and have the concept of Java Fundamentals, Swings, JDBC, Applet, JavaBeans, etc. then you can go for Advance Java. What is Web Designing & Development? Hypertext markup language (HTML) is the foundation for any website. It is often known as the building block of a website. You can assume HTML as a simple house of just bricks and no other elements. HTML uses tags e.g <HTML></HTML> and in between these tags one can write the content to be displayed. There is no other way to display content in a web page. HTML does not need any special IDE, you can write an HTML code in a notepad file. HTML 6 is the latest version which has been released recently. If HTML is the brick structure of a house, then CSS is the plaster, paint and every other item used to decorate the house. CSS is a styling sheet which is used to decorate HTML structure. CSS to do not need any special IDE it can be written in a notepad or any other text editor. The latest version is CSS 4. Nowadays Bootstrap is also used to write CSS as it provided built-in libraries which makes it easy to use. JQuery, Angular JS, Node JS are other advanced forms of JS meant to make coding easy and efficient. Hypertext processor is a scripting language majorly used in web development. It can be embedded in HTML code, but it is mostly used for database connectivity. Python is a high-level programming language. This language is trending day by day as it is easy to use, offers the best efficiency and is open source. Many big names like Google are migrating from PHP to python which is adding to its value. This language needs .net framework to work on. Since it’s not an open source, therefore, it is less used and less preferred. It also works on .net framework, but this language quite famous for its features and robustness. Why Is REWIRE Best For Programming & Web Development Training Institute In Dehradun? Programming & Web Development Training courses are one of the most important and demandable courses by IT industry and so by youngsters also. Despite this, many institutions take it lightly and generally, ignore the career of students for the sake of money. But unlike others, Rewire and its team is dedicated towards the children’s futures, gives the real competitive environment, which they are going to face in their future days. Our Rewire team is here with a mission to give the best quality education and real essence of programming, through entire Dehradun. And for this, we at Rewire Institute of Computer Science, have prepared with perfect teaching techniques and approach, so that the students can go from here with perfections to face the real world with full enthusiasm. Here are some teaching methodologies for boosting student’s learning. We teach students in such a way that they don’t have to cram the things. We at Rewire, know the importance of practical things, hence we focus more on the practical part rather than theory part. It means, in our classroom we give 80% practical classes and 20% theory session. We at Rewire, give focus more on clearing the basic things of both programming and web development training courses. The very first step to get a perfection in any course or subject, the very first thing is to work on basics because it takes you to the level of supremacy. So, we give special attention to the basics. We at Rewire gives the equal importance to the problems of the students because it is the hard work of a student who gives their time to the topic and stuck into it. Then, problem-solving session works greatly to the student’s doubt and after that, they will not forget the topic. At the end of the course, each and every institute gives the old and repetitive projects to the students. But these useless projects have no importance in the real world and industry, too. But at Rewire, we provide the new, innovative and realistic projects, which are used in our IT industry. Programming and web development are the fields, which changes every other day and hence, we make sure with our students that they always keep in touch with changes and stay ahead with the latest technologies in the real world. So that they won’t left behind in the race of success and achievements. Learning things is not enough to cope up with the real industry. One should know the techniques and way to impress the IT industry by their sense of humor, a way of talking and many things. But many or I can say, almost every institute ignore this important thing. But we at Rewire, prepare students in both learning and personality etiquette. We provide the special classes for the personality development session so that they perform well in their Interview round.